The basic Java interface representing a printable series of pages is java.awt.print.Pageable (upper left). J2Printer is able to print any series of 0 to n Pageables in one document. The J2Printer14 subclass of J2Printer supports the additional Java printing APIs introduced in JDK 1.4. J2PrinterWebStart is a subclass of J2Printer that supports printing from Java Web Start applications using the JNLP API. 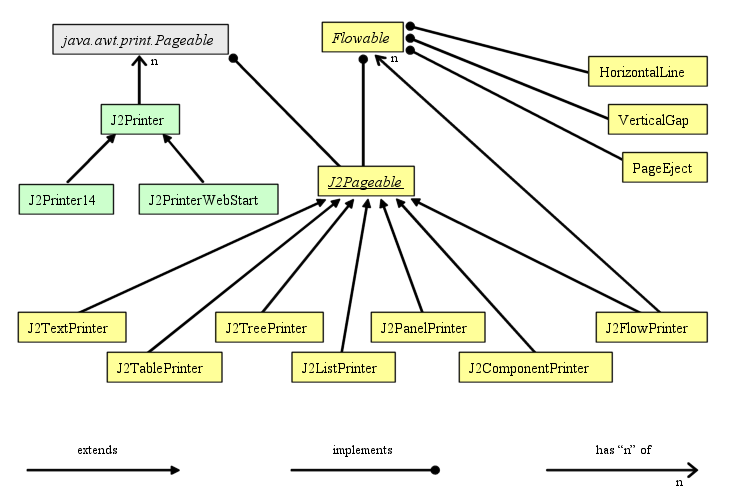 At the center of this diagram, the abstract base class J2Pageable implements the Flowable interface and implements java.awt.print.Pageable. The six primary J2PrinterWorks component printing classes J2TextPrinter, J2TablePrinter, J2TreePrinter, J2ListPrinter, J2PanelPrinter, and J2FlowPrinter all extend J2Pageable. By implementing the methods in Flowable interface, these classes are able to inherit a full Pageable implementation (with support for headers, footers, margins, etc.) from J2Pageable. Likewise, anyone can create fully-capable J2PrinterWorks printing components by extending J2Pageable and implementing just the methods of Flowable. J2FlowPrinter is a special component printing container class that can print any series of 0 to n Flowables as either a Pageable or a Flowable. Finally, HorizontalLine, VerticalGap, and PageEject each implement Flowable and are useful in building up complex documents within a J2FlowPrinter.